My mother has been busy knitting, and sent us a shepherd with staff and sheep to add to last year’s Mary, Joseph and Jesus. My mother moved out to Madeira when she retired, so I don’t see her at Christmas, but I can still smile every time I see her knitted nativity on the mantelpiece. We’ve had a fun if frantic time, packing in Christmas and two birthday during the last fortnight. Every so often we even paused long enough to enjoy it. Now I’m looking forward to seeing in the New Year this weekend, and in the mean time, here’s a round up of our five suitably festive frugal things. 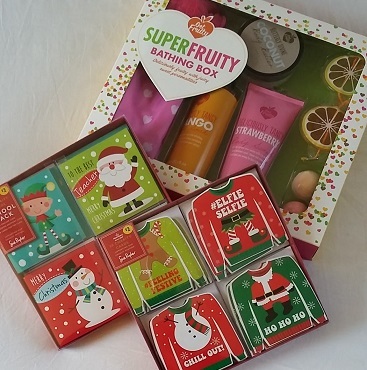 Rather than splashing out on a new colour scheme every Christmas, we enjoy retrieving the boxes of Christmas tree decorations and hunting for familiar favourites. The decorations are a motley collection, bought, given or made by the children. I get filled with nostalgia bringing out the dragons from a trip to Hong Kong, or the wonky salt crystal star made by my daughter. There are a few fragile baubles remaining from the very first Christmas tree my husband and I ever decorated together, a silver bell that’s older than I am, a wonderfully carved wooden snowflake and some glam glittery disco balls. Spending an afternoon together, with the whole family taking it turns to put decorations on the tree, is one of my favourite parts of preparing for Christmas. This year I had the blissful prospect of heading to the grandparents for Christmas itself – which meant I didn’t have to cook! However, I did make some cranberry sauce and mince pies to take along, plus the ingredients for my husband’s favourite coffee and walnut birthday cake. One of my daughter’s godfathers popped round on Christmas Eve to deliver a present, so I pottered around making mince pies while he and my husband chatted over a cup of tea. I used an old faithful recipe from the Mary Berry Christmas Collection*, where the pastry gets a lift from adding a bit of icing sugar and the grated zest of half an orange (recipe is also in this article). 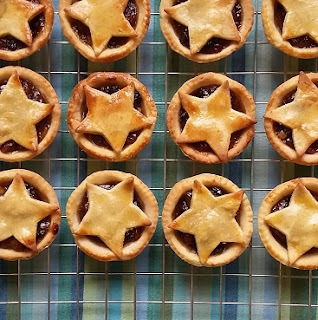 I spent £1 on a jar of mincemeat, which stretches to make 24 mince pies. With the addition of Stork, value range plain flour and mixed weight free range eggs, they ended up costing just 10p each. Every year, I save some of the Christmas cards we’re sent, and make them into gift tags for next year’s presents. In theory, I get busy with the ruler, craft knife and hole punch early in the New Year. In practice, I was frantically cutting out tags on Christmas Eve, and attempting to match pictures to the recipients. 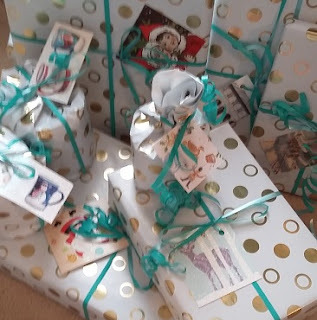 I rather like the end result, especially when the wrapping paper cost £99p for a 2 meter roll from QD and the ribbon was £1 for 20 metres from Flying Tiger. Despite the accusations of child cruelty, we dragged the kids out for a family walk across the fields on both Christmas Day and Boxing Day. I love getting blown about outside in the bright winter sunshine, and returning for some well-deserved ginger wine. 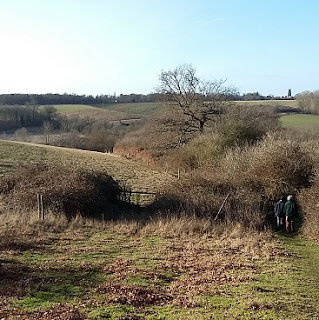 My daughter ended up running from one clump of trees to another, while my son hunted for light sabre sticks, and we could all admire the amazing scenery. Total cost: absolutely nothing at all. Back at home I ignored the suitcases and boxes of presents that needed unpacking, and headed out to check the sale shelves at Morrisons and the Co-op. I reckon one of the best things to buy in the January sales is stuff for next Christmas. Glad I managed to get half price Christmas cards for my children to give out to their classmates (£2 for 60!) again, plus a bath time gift set that will be a perfect party present for one of my daugher’s friends. I also loaded up with some marked down goodies including a box of Florentines and a tin of shortbread for New Year. Healthy eating can start in January, can’t it? Excitement this week included chatting to Sarah Lilley on BBC Radio Suffolk about sale shopping and financial tips for January. If you’d like a listen, scroll along to 2:30. I’m also very over excited because I’ve written about our 2016 month-by-month money saving progress for the Money section of the Sunday Times. Grab a copy of the paper this weekend if you’d like to read it! Hopefully some of the tips on how to cut costs and earn more might help if money is tight in January. I’m then due back on BBC Radio Suffolk to talk to Georgina Wroe about the article (Sunday Jan 1, about 12.30), and will also be discussing it with Ed Bowsher on Share Radio (Tuesday Jan 3, about 1.50pm). Fingers crossed I can cut down on the number of times I say “urm” and “I think” and actually get something useful across! How was your Christmas? Any frugal tip to share? I’d love to hear! Think the official #5frugalthings blog linky with Cass, Emma and Becky will be restarting in January, but if anyone has any #5frugalthings posts before then, do bung them in the comments below! Well done, as ever, on your frugality. But I thought everyone used their decorations year after year and perhaps only added a new one occasionally. Of course, if you are newly-wed or newly-living-together, you need to buy a whole pile of decorations, but usually, they come out of the loft or a cupboard once a year and you enjoy seeing your old decorations again. Also, I thought most people cut up old cards to make gift tags. I've always done this, or simply used stick-on address labels when I've run short of time to do the cutting up of cards. But yes, a good frutal idea for those who have never done this. I wish I had a money-saving tip for you, but keeping away from shops unless you actually need (as opposed to merely want) something, is a good idea. And one must not forget that even if you are shopping in Sales, you are still SPENDING MONEY. Saving means saving, not spending, regardless of Sales. Lovely to hear from you Margaret. So agree that shopping in sales is still spending money! It's a bug bear of mine about vouchers and cashback too – sure, maybe there's a discount, but it still involves spending. I always thought people reused their decorations year after year as well. But looking at social media, some people do seem to plan entirely new colour schemes and even multiple trees. Aside from the expense, I really enjoy rediscovering our decorations. It's a lovely part of Christmas for us. I love your knitted holy family. Thank you! All my mother's own work. Nip back in a few years, and we might even have a trio of Wise Men. We try and buy one new tree decoration each year during our summer holiday. Then it is labelled, in minute writing, on the back. Each year as we decorate the tree, happy memories flood back. Often they are inexpensive repurposed things, like the tiny metal Eiffel Tower keyring, re strung on a ribbon. But they are very special to us. I see no point in a fresh decoration scheme every year. Really great when the memories flood back isn't it? 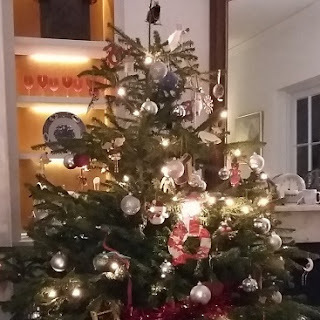 We rarely travel further than Norfolk or Dorset since the children, but smile every time we see the decorations from further afield – as well as the crown from Holkham! There are some good tips there, and everyone should remember that just because we traditionally do some things, re-using collected decorations, cutting up this cards for next years gift tags etc, it doesn't mean that everyone does it. Until you pick up a good tip or if it's something your family have never done you wouldn't perhaps think to do this, and this is where a good blog such as yours is extremely valuable for people new to the money saving and frugality game. Sue! So nice to hear from you! I do miss your blog, and picked up so many tips myself there. Love the idea of a whole staff of shepherd employees, must request that from my mother. 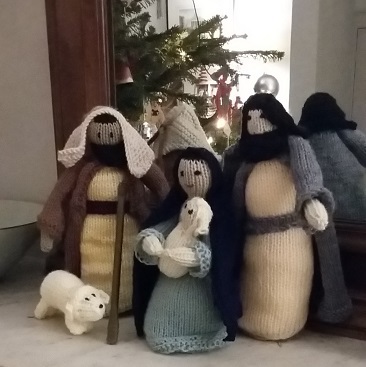 lovely post, and I love your knitted nativity! so sweet. You have some good frugal hints and tips here. Thanks Sadie! Happy New Year to you too.